A top European Union court on Thursday upheld the ban on three insecticides blamed for killing off bee populations, dismissing cases brought by chemicals giants Bayer and Syngenta. The decision involves a partial ban by the European Union from 2013, but the bloc has since taken more drastic action after a major report by European food safety agency targeted the chemicals. 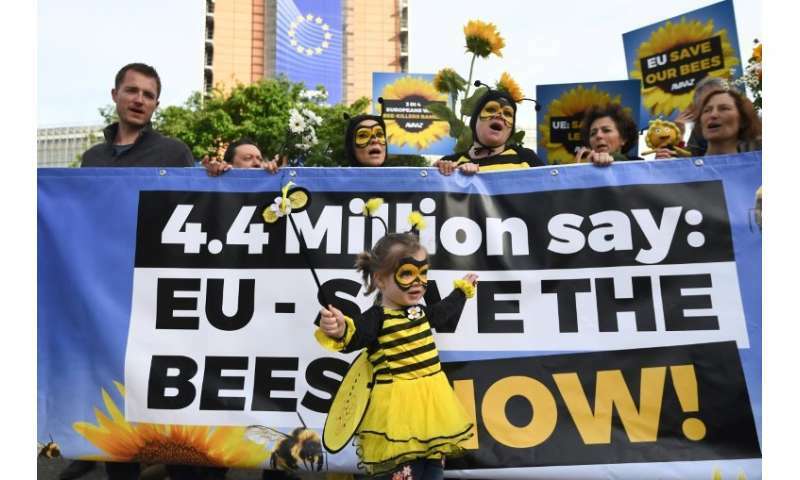 "The General Court confirms the validity of the restrictions introduced at EU level in 2013 against the insecticides clothianidin, thiamethoxam and imidacloprid because of the risks those substances pose to bees," a statement said. "Given the existence of new studies ... the Commission was fully entitled to find that it was appropriate to review the approval of the substances in question," it said. Bees help pollinate 90 percent of the world's major crops, but in recent years have been dying off from "colony collapse disorder," a mysterious scourge blamed partly on pesticides. The pesticides—clothianidin, imidacloprid and thiamethoxam—are based on the chemical structure of nicotine and attack the nervous systems of insect pests. Last month EU countries voted for an outright ban on the use of the three neonicotinoid pesticides in fields meaning that they can only now be used in sealed greenhouses.